... Newly captured prisoners began to give real information - a grand offensive was to be made [where] the Marne was only about 50 yards wide ... We had 600 yards of [this] front all to ourselves ... [When it began] it seemed [the Germans] expected their artillery to eliminate all resistance ... French Officers attached to our Brigade stated positively there was never a bombardment to equal it at Verdun. The enemy had to battle their way through the first platoon on the river bank - then they took on the second platoon on the forward edge of the railway where we had a thousand times the best of it - but the [Germans] gradually wiped it out. My third platoon [took] their place in desperate hand to hand fighting, in which some got through only to be picked up by the fourth platoon which was deployed simultaneously with the third ... By the time they struck the fourth platoon they were all in and easy prey. I have never seen so many dead. I have never seen such a frightful spectacle of war. 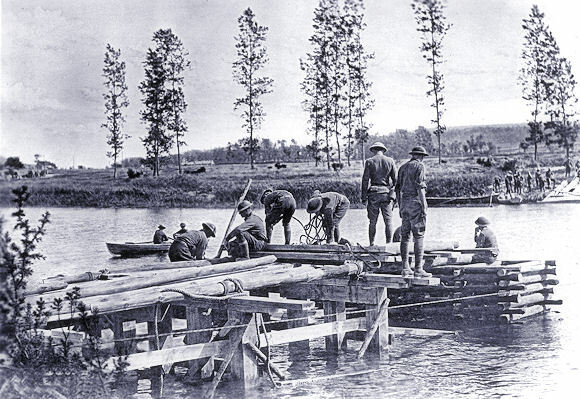 On the other bank the Americans, in close combat, had destroyed two of our companies. Lying down in the wheat, they had allowed our troops to approach and then annihilated them at a range of 30 to 50 yards. "The Americans kill everyone," was the cry of fear on July 15—a cry that caused our men to tremble for a long time. We reached the front line exhausted but, without slowing up went immediately into battle at daybreak. We reached the line just in time to go over the top at the zero hour. ... A division of Americans [2nd] and a division [1st] on the left flank in the [initial] drive, while a division of Moroccans was attacking in the center. Much airplane fighting was going on, and several [planes] got shot down ... We must have gained seven or eight miles that day, driving toward Reims on the left flank of the Marne salient. That night we stood by our guns to hold the gain, but we were tired and hungry. The surviving marines who left the battle line were a terrible looking bunch of people. They looked more like animals ... Late in the evening we survivors got a meal of slumgullion ... There were so many wounded in the attack that the ambulance service broke down ... the boys were more despondent than I ever saw them after this battle. Thurs. Sept. 12th, 1918. Hiked through dark woods. No lights allowed; guided by holding on the pack of the man ahead. Stumbled through and under brush for about half-mile into an open field where we waited in a soaking rain until about 10 pm. Friday, Sept. 13th. A Great Day for the Americans. Our infantry is still pushing 'em back. Many prisoners are going by. We were at guns all morning, but had to stay in camp all afternoon. We are out of range and await orders to move up. Steady stream of men and material going up constantly. Two of our boys sneaked off and went up to the old Hun trenches and brought back lots of Hun souvenirs -- razors, glasses, pictures, equipment, etc. I robbed every dead "Boche" I met where I thought I could get something, except at St. Mihiel where they were strewn like mown grass. I saw on this front without exaggeration, fifteen hundred on one field, also Yanks which were numberless. It was here we lost Paul J. Karney, our lieutenant of the second platoon, he was as fine a man as you could find in this A. E. F. He sure was a Prince, he was engaged to a Mount Holly girl, it sure did put a fighting spirit into us to see him get "picked off" . I helped to bury him under heavy shell fire and he lies buried in Vieville, 14 miles south of Metz. "Bump" O'Hara is buried here also. "Bump" was standing up straight and took off his helmet when a piece of shrapnel hit him across the forehead about one-half inch above his eyes. He never knew what hit him for he never regained consciousness. 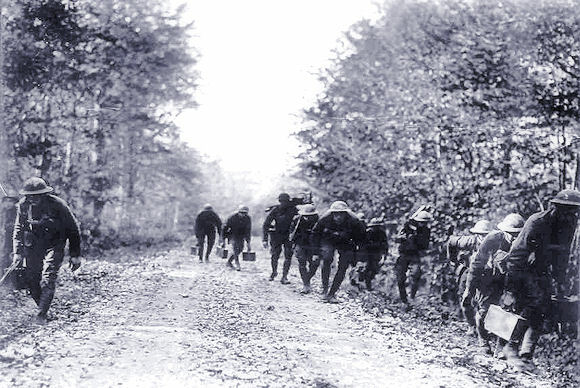 ... After a tiresome, weary march through shelled road, devastated villages and destroyed forests, we advanced to the Argonne Forest, arriving and relieving the French at about three in the morning of September 26, 1918. ... Boy! Oh boy! What a beautiful sight just about dawn. It was light enough so that you could see for a hundred yards or so and stretched along was our first wave as straight as possible, skirmish formation advancing steadily as if we were on parade. Sergeants led about 10 paces ahead and spaced every 20 feet, lieutenants and captains a few paces more advanced with their automatic pistols in one hand and pistols in the other. Yesterday evening I started out with Captain Driscoll & Lt. Evans to set up an advance post -- but we found the former no man's land absolutely impassible except for foot and horseback, -- so we couldn't carry our equipment up. 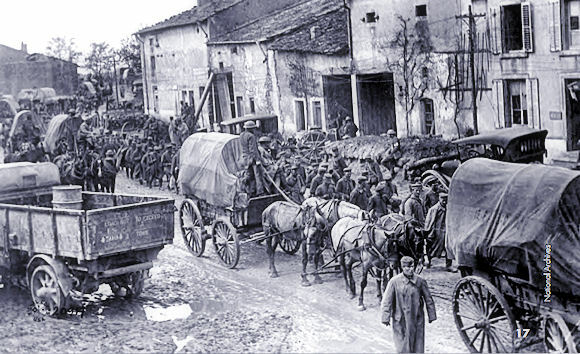 Roads were filled with supply and munitions trains which had the right of way. On October 15th, 1918, we were charging machine guns and men were being cut down like grass all around me. Then I was hit and fell, and couldn't get up. I laid there on the battlefield for three days and was assumed dead. Some man came by and said: Fields, what the hell are you doing laying there? The man picked him up, put him on his shoulder, and carried him three miles to the aid station. ... A hundred and thirty-four of us had come back from Blanc Mont ridge. We had gone up a full-strength battalion, a thousand strong.